On January 1, 2002, the Parti Québécois government of Quebec amalgamated a number of municipalities throughout the Province, including the five former cities that constitute the current City of Gatineau (Aylmer, Hull, Gatineau, Buckingham and Masson-Angers). Hull was still considered the primary city within this region, although the former Gatineau had a larger population. Nonetheless, the name Gatineau was chosen for the new amalgamated municipality because it was more representative of the region (given that the former Gatineau county, the federal Gatineau Park, the Gatineau Hills, and the Gatineau River defined the area geographically, in a less restrictive manner than Hull). The Gatineau name was chosen, despite the fact that "Hull-Gatineau" was the most popular choice in opinion polls, because the transition committee excluded hyphenated names from the ballot, and despite the fact that the Hull name had represented the earliest urban development in the area. Also the fact that Gatineau is more French has likewise influenced the choice of largely French-speaking inhabitants. On June 20, 2004, the current Liberal government of Quebec fulfilled a campaign promise by holding a referendum vote, giving the residents of the former cities the choice of separating from Gatineau. In order to separate, the residents of a former city required a double-win: more than 50% of the vote representing at least 35% of the electorate. 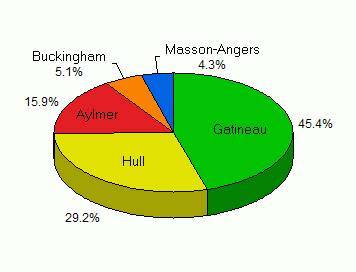 The majority of the votes cast in Aylmer and Masson-Angers were in favour of separation, but they did not represent at least 35% of the electorate in their respective communities. The majority of voters in Buckingham and Hull, chose to remain part of Gatineau. The participation was very low, and the status quo can be partly attributed to the indifference of the citizens. There was no referendum in the former city of Gatineau. From Wikipedia, the free encyclopedia.